We are an ISO 9001-2008 certified CPRI approved manufacturers of Control Panels since last 20 years. We offer a wide variety of temperature sensors of REDLION. · Both RTD and thermocouples sensors are available in various mounting configurations to satisfy your application requirements. · They are available with quick disconnect ends and field-cuttable cables, with optional amplifiers. MCD 50-B-OS: Coordinated lightning current arrestor, Type 1 (Class B) to EN 61643-11. For interface 0 to 2 (LPZ) according to lightning protection zone concept to IEC 61312-1 and DIN VDE 0185-305. MCD 125-B/NPE: Coordinated N-PE spark gap, Type 1 (Class B) to EN 61643-11 for use in TN-S and TT systems. 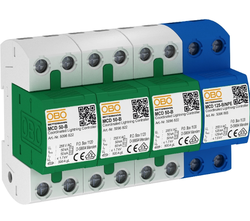 For interface 0 to 1 in accordance with lighting protection zone concept to IEC 61312-1 and/or DIN VDE 0185-305. • Can be used in standard distributor housings.